Suave has created a new line of skin care products that is definitely working to eliminate ashy and welcome ravishingly beautiful skin. Their NEW Suave Naturals Wild Cherry Blossom Indulgent Body includes Vitamin E and Cherry Blossom extract that definitely pampers your skin. Suave Naturals Body Wash moisturizes while cleansing your skin and the scent is delish! Not too strong and not too weak, but just right. I'm very sensitive to strong smell and so this is just perfect for my nose. What woman hasn't lusted after the much sought after shea butter and cocoa butter for their promise of beautiful, soft skin. I know I have since I was a mere child! This is where Suave Skin Therapy Cocoa Butter with Shea comes in. You can use it anytime, all the time and anywhere and you smell yum! I got to try a few of their products and I love them. I sometimes use Suave products and have always thought their products were great so I enjoyed using these products. Actress and (busy!) celebrity mom Holly Robinson Peete is teaming up with Suave in their skin care program dubbed "Shower Yourself Beautiful". With fun and easy to do tips, Robinson encourages us to make the most of life's small indulgences in taking care of our bodies and in doing so replenishes ourselves as a whole. Suave®Skin knows how important it is for busy moms - like you - to take time for yourselves. That's why they want to provide you with everything you'll need to "Shower Yourself Beautiful" every day. Shower yourself beautiful by hosting an at-home spa day. Invite girlfriends over for manicures and pedicures and paint fingers and toes summer-inspired shades of sorbet. Once nails are dry, generously apply a moisturizing body lotion to keep hands and feet soft and smooth all summer long. Studies show that taking even a two minute break from your hectic schedule can reduce stress levels. Try this trick to add some relaxation to your daily grind. Instead of rushing through lunch, schedule a leisurely tea time for yourself complete with mini tea sandwiches and a cup of chamomile tea. Then get settled in a quiet part of your home or office -- free of distractions -- to start your summer reading list. Send yourself some flowers -- especially if you already need to swing by the florist to pick up flowers for a wedding or baby shower. Seasonal summer flowers, such as lavender and sweet pea, are a budget-friendly way to pamper yourself and brighten up your home. Trade in your daily shower for a relaxing bath that’s fit for a queen! Transform your bathroom into a private sanctuary by lighting an aromatherapy-inspired candle and playing your favorite tunes. 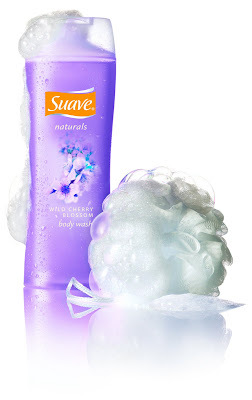 Be sure to use Suave® Naturals Lavender Vanilla Calming Body Wash. The soothing scent of lavender will calm your senses and transport your mind to a tranquil oasis. The pampering of yourself continues with the chances to win some great giveaways! You can actually enter two separate giveaways. Starting on June 15th, Suave began weekly giveaways for chances to win some amazing prizes for your bathroom, bedroom, kitchen, living room and summer traveling. Visit here to go to Suave's site for their cool giveaways and for a chance to win the ultimate at-home shower for yourself and your friends. The second giveaway is through Amy Sobel and Momselect. I have a bundle of 3 Suave Skin products to give to one lucky winner. To enter just visit Shower Yourself Beautiful and let me know what gifts you entered to win. Please ensure you do have a valid email address on your blog profile page or in your comments so that I can reach the winner. This giveaway ends July 26, 2009 @ 11:59pm. Contest open to US residents. I tried to win the water filtration system, the set of canisters, the hand mixer, espresso machine & smoothie machine and was not an instant winner. Reading your RSS feed on Google Reader and reading at rubymoonstone/gmail. That was fun. I picked the pasta maker, indoor garden, juicer, breadmaker and flatware! I entered to win a panini maker, bread machine, pasta maker, juicer and flatware. I tried to the set of canisters, the hand mixer, espresso machine,the serving platter & smoothie machine and was not an instant winner. I entered for the Set of canisters, Coffee maker, mixer, Smoothie maker and set of Cookbooks! I entered for the water pitcher, the glasses, etc- but I didn't getr the instant win ... this time! I am a follower of yours via My AOL. I tried to subscribe by e-mail. When I entered and submitted my e-mail adress, the reply was that you didn't have that option available. I hope this entry counts. Just thought you might want to know that it wasn't working! I want to relax in that comfy chair at the top of your blog! Happy VGNO...stopping by a little late! I follow your blog via google friend connect. BTW, the twitter button you have on the right side of your blog leads to an invalid twitter account. I entered to win the crock pot and juicer on Suave. I picked TV Dinner Tray Tables & Suave Fresh Berry Smoothie Luscious Body Wash, bean bag, floor lamp, pillows and remote. I chose Side Table, TV Tray Tables, Universal Remote, Throw Pillows and Universal Remote. I tried to win the knit blankets, movie tickets, and boardgames. Not an instant winner. I entered today for the Media Closet ,Bean Bag Chair & Suave Firming Body Lotion ,Side Table ,TV Dinner Tray Tables & Suave Fresh Berry Smoothie Luscious Body Wash. I entered to win a digital camera, mp3 player, binocular, watch and DVD player. Thanks!